(The usual Disclaimer)I'm not an expert, and there are a thousand ways to do most everything. This is just how I do things. Hopefully I can provide a little inspiration, or help someone over a hump. So where do I get ideas to carve? Everywhere. When a thought comes into my head to carve something I head for the WWW. 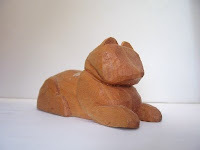 Plenty of carving sites have plans or patterns, some for sale and some are free. Sometimes I just search images. Save them, print them, heck, trace them off the puter screen. So now I have an notion to whittle something, and I've done some research, and maybe refined the pic in my mind, it's time to get the idea out of my head onto paper or wood. What size should it be? What size wood do I have? I cut a square block to start from, and if it is small enough I trace the outline onto a piece of paper several times next to each other. Here's the sketch for another pen, a bee. So far my pens have been about 7" long, I start with blocks of Yellow Cedar (all the YC I have is about 1-1/4" square) I thought the first sketch on the left was a little too long, so I made the blank barely longer than the pen insert I use and am hoping not to expose the drill hole when I whittle. The sketch is only to establish proportions and shapes/relations, a lot of the design work for me will be done 'under the knife'. I like the last sketch on the right, I'll cut that out and tape it in a spiral notebook I keep most or all my ideas in. I can see one modification I'll make when I whittle- the wings will probably have to be shortened to make the pen more comfortable to hold. I read some great advice on the The Whittlers Porch: Carve a little bit every day, even if you only sharpen a pencil. both the Porch and Wood Carving Illustrated are great resources for inspiration and answers. 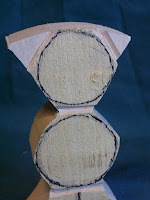 If you join the forums section at WCI you'll have access to tons of pics of other peoples work. This is just the way I make these guys, certainly not the only way. I got the idea from Will Hayden, see the links section and look for Lesson 4, I think, in Will's Classroom. Actually take a look at all the lessons in the classroom, and don't forget to bring your knife to class. I've made a bunch of these, tho it is Will's idea I don't make them quite the way he does. 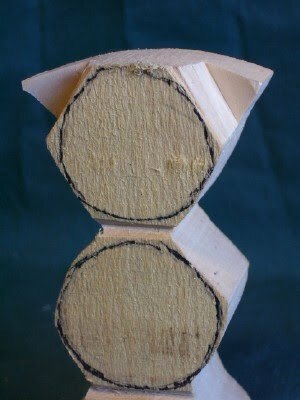 Basswood blank is 1"x2"x4", since I've made a few I have a pattern to try and make them come out a little bit alike, and I rough saw the outline. I've sketched in suggestions for the shapes of the head body feet and legs. 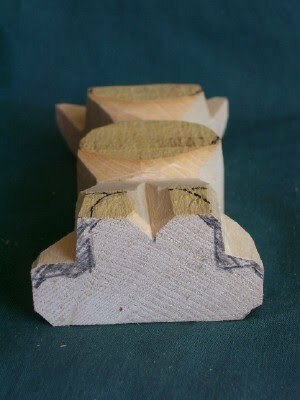 I cut some shallow vee's/notches/wedges to divide the major body parts- ears head body legs feet. They're shallow straight cuts near the lines, I'll refine shapes later. It might take several slices to make one vee- I find that small slices mean more control and less bandaids, also less sharpening and less fatigue. I took a top-down approach to this guy, not my usual method. I tend to jump around, and whittle whatever strikes my fancy from second to second. At the notch for the ears, remove material on the ear side of the cut till the entire ear is flattened to the depth of the cut. Cut another notch and flatten it some more. My goal is to remove the front half of each ear. I undercut the front face of the ears, this surface is close to finished. I curve the upper part of the face with a twisting motion of the knife, cutting first along the top of the nose and curving up to finish the cut vertically at the forehead. The first cuts only give me a small eighth inch wide curve, but a shaving at a time will get to the point in the photo. 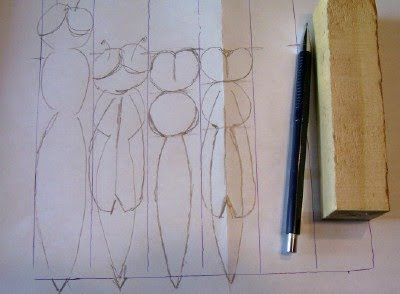 Sketch in the feet from the bottom and get ready to cut some more notches. There's a lot of notches in whittling. Cut out most of the blackened areas, but leave a little for the final cleanup. That's really the majority of the work on this little guy. He's not done yet, but the rough work is complete. 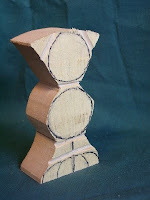 We've got the basic parts proportioned, what's left is the details. I'm not sure how this one will look when it's done. There's still a bunch of room to adjust the shape and size of the feet, shape of the legs- will he he be knock kneed? Double jointed? Will he have knees at all?. Will he have a neck? What shape will his eyes & nose take? 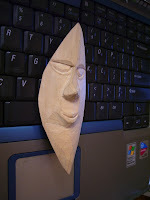 I woodburned most facial features on the ones I've finished, and have only whittled the last couple. Here he is, same point as above. Little guy is flat backed, meant to stand up against a wall or similar. 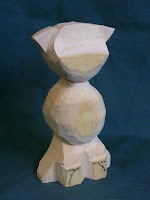 I only shape the ears from the back, and run a little bevel aroung his outline. There he is, done (below). Eyes, nose and mouth are pretty simple, he's a simple piece and I feel like complex features would be out of place (just my opinion) . 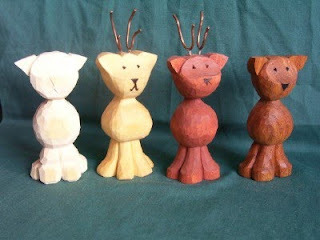 Last pic shows the four reindeer I can actually round up, the washed out guy on the left is the one in this blog. Just a little sampling of the different things you can do, feet, legs faces ears a little different on each. One on the right (only doe in the herd) is made of rosewood, probably Narra judging by the amount of silica in the wood. 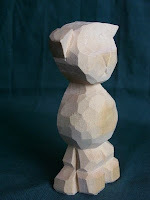 She was brutal to carve and required a lot of honing. 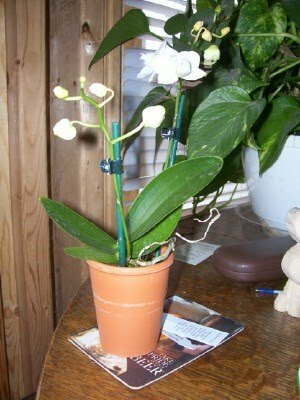 This little orchid (Phalenopsis sp.) sits on my desk, it's about 8 inches tall. That's art. Its awe inspiring, exquisite. I bought it at Walgreens. What I do is not art. That being said, here's the latest example of my craft, another pen. Its a dog. He was a little easier than the octopus, mostly on account of I actually own twodogs. Or they own me, or something. We live together and I do everything they want. 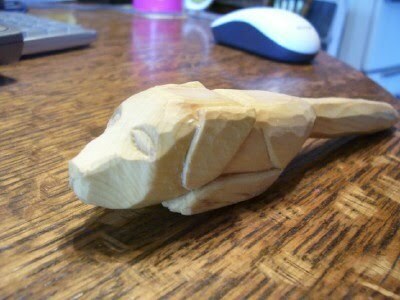 Nother neat thing about whittling, it (can be) a cheap hobby. You can get a knife and an awful lot of wood for less than you'd pay for one good golf club (so I've heard, I don't golf. That's another story...) I say it can be cheap cuz like anything you can go overboard, top of the line pocketknives running at $100 or more. You can pick up either of the two knives I've mentioned, the Rough Rider Dual Whittler or RA Murphy bench knife for under $20. 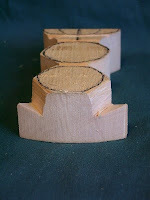 You'll find Basswood pieces all over the web for a buck or three. That is really all you need. You can turn a square into an egg with just your knife, I did. 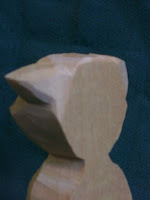 Kokopelli was all whittled, no sawing. I thought it would be a neat excercise in symmetry,and it was, I recommend any beginner to give it a whirl. Stop with the egg, or go a little further, whatever makes you happy. Hint- when I'm trying to make something symmetrical- round, or flat, etc- I don't rely on my eyes. My hands are better at detecting the small differences in a surface. It's easier to feel a high spot, low spot, or other deviation. Rotate a round piece in your hand to feel for out of round. I just finished the Octopus pen and am starting on another, dog this time, I sense a future blog, maybe a step by step is in order. Alaskan Yellow Cedar, cuz pencils are supposed to be made of cedar arent they? Tempera paint red, sharpie black and shellac clear coat on top. The shellac made the sharpie bleed a little, shoulda used paint. They're shavings. They need to be made. They were stuck in this piece of wood,I just let them out. Sometimes, when you have let all the shavings out you find something neat inside. Why do I Whittle? That's easy, when I pick up a knife & wood the world goes away, time stands still. Why did i start? Not so sure on that one. Parental emulation played a part, Dad carried a pocket knife, decided at 8 yrs I was old enough to have one, showed me how not to cut myself and told me to keep the mess outside. 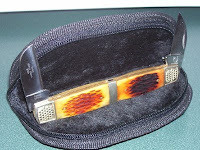 Pocketknife was a rite of passage closer to manhood, twigs were plentiful. 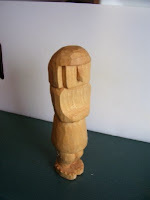 On the other side was Mom, she did everything including carving. 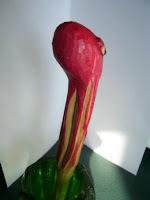 No easy softwood whittling for her, she relief carved cherry and purpleheart. 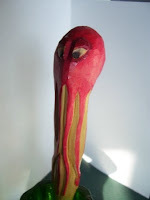 I have the Ibis (wading bird) she carved in cherry,one sis has the matador in purpleheart.No machinery to rough it out, just hand tools.I loved the Ibis from the day she started it, I remember one horrible weekend she entered it in a arts & crafts show with a PRICE on it, ONLY $100.I was so afraid it would sell.It hangs on my living room wall. She carved a fish underwater, Bass I think (bas relief). I'm not sure what ever happened to it. And of course, she gave me the knife that got me started again, that was a couple blogs ago. Pick up a knife. Let the shavings fall where they may, cuz sweeping is therapeutic. Thinking about health, heart health and mine in particular. I'm overweight under exercised and in my opinion over medicated. I need to do the work (exercise is more than 4 letters) to change all that. So the thought process as I was waking up got around to the symptoms of heart attack- shortness of breath, pain in chest and extremities- and I realized those are the same symptoms of Exercise. Seems to me exercise might be as bad for you as not exorcising, so I rolled over and went back to sleep. 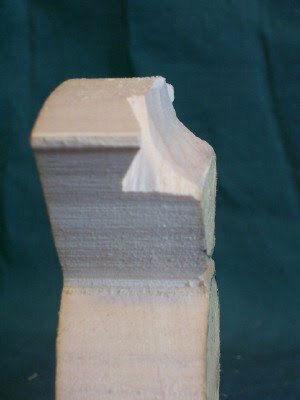 I started this blog to share my whittling, the neat part about that is whittling is often a social experience- a bunch of friends sitting around making shavings and talking. 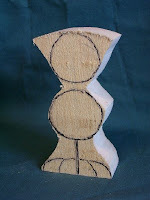 So, I can go "off topic" and still be true to the spirit of whittling. If you are so inclined, join the Whittler's Porch group at Yahoo-We're a small friendly group, and its not all about wood or knives- our last thread was about gardening. http://www.willhayden.com/ Will is a friendly guy, and exchanged a couple emails with me when I was getting started again. He's got a bunch of neat patterns there, he uses multiple carving tools but don't let that stop you. I think you can whittle all or at least most of what you see there with just a knife. Anyway, this little reindeer is basswood, minwax stain, eyes nose mouth are woodburned in. He is flat in back, he is meant to stand up against a wall. Antlers are copper 12 gauge electrical wire (house wiring) soldered and epoxied into drill holes. 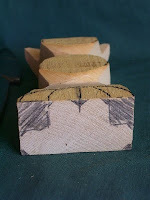 Will has a couple other ideas on how to make antlers,I say look around and see what you can find. I've carved a dozen trying to get a set of eight for myself, they disappear when female family members come by. One jumped into a box I was prepping for shipping while I wasn't looking too. I think I have four. I whittled one out of some rosewood I had hanging around, man that was some hard wood. No antlers on that one, either its a doe or I'll find some gold wire to do justice to the rosewood. One day I'll carve one in the round, and put a cute little rump and tail on. Everything I whittle is fun, otherwise why do it, but these guys are especially fun. I'm not sure why, partly cuz they're so cute, partly cuz they have the Awwww factor and other people appreciate them, and partly because I've whittled multiples and don't have to think much about the process. 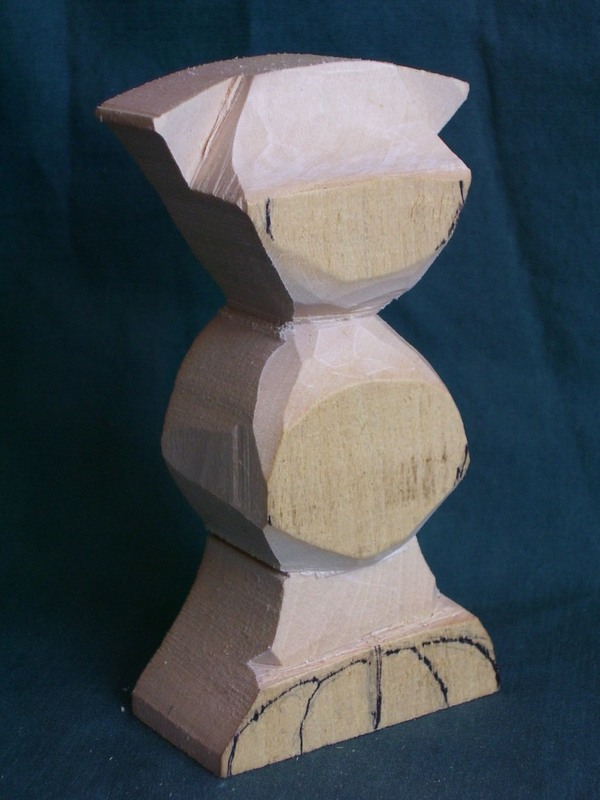 I have three whittlings in process now- a basswood chess set 6 of 32 pcs done, (this one's gonna take a while), a staff with a frog on top, I think it's elm (found the sapling alongside the neighbors garage) and an Octopus pen for my younger daughter, made of Alaskan Cedar. Whittling is a spontaneous feel good activity for me, and I feel no pressure to finish one project before going on to another. Hey- keep you knife sharp, your bandaids close and let the shavings fall where they will. The Frozen North is not so frozen this week. We are slated for up to 10" of snow over the next 48 hrs, but the temp is above 32 and what snow we have is melting and dripping off the high roof.. Sounds like rain in here as it hits the lower kitchen roof. I got a quick look at some of the carvings, but did not get to explore the site much. Nice work. Hey out there, cabin fever setting in here in the frozen north. My house looks like a cabin with all the construction, but I won't lie, I'm totally urban. Nothing remains from my earliest days whittling except my memories, and the second knife I ever had. I have no recollection of the fate of my first knife, the second one has been sharpened so may times the blade is probably half the size it was and is pretty far out of shape. Here's a pic of the first thing I whittled when I started up again, he's based on the Kachina dolls made by the southwest Native Americans. To date he has exhibited no magical powers. Basswood, 2" x 2" x 10" more or less. 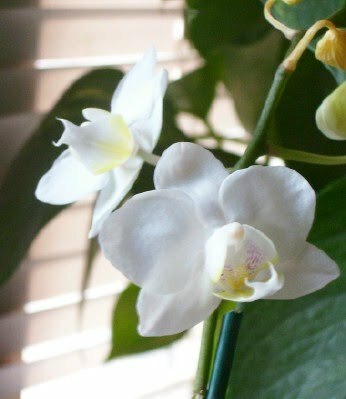 He stands in the south facing bay window in my kitchen, among the houseplants. He originally had hands; they were ugly and were removed. Use your imagination.Finish is two or three coats of Tung oil. with that knife. SphinxCat lives over the sink at the moment, guarding the dish soap and watching dishes dry. (well, he'd watch if he had eyes). Finish is also multiple coats of Tung oil- it's readily available, easy to apply and you can stop at one application or build to a shine. Just make sure the previous coat is dry, and remember that later coats take longer to dry since they cannot soak into the wood as well as the first. This is the knife I'm talking about- made in USA by RA Murphy Co. Carbon steel blade, not very expensive. Mine has a 3-1/2" blade, they make two smaller, I'll try the 1-3/4" size one day. Good steel, nice fat handle- in fact this is the handle I patterned my leather wrapped knives after. The only other thing I whittled with it is a blade cover, sorry no pic. Whittling- knife in one hand, piece of wood in the other, make something. If the wood is clamped to the table/bench, is too big to hold or additional tools are used you are carving. 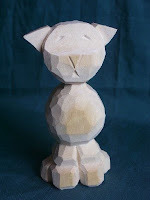 If you are using power tools you are carving. Exception- it's ok to use a saw to rough out the outline before you pick up a knife. 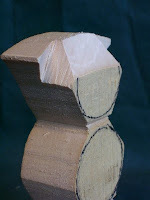 Whittling is about the journey, not the finished item. Its a hobby, a way to pass the time. It's not a way to make money. Carvings are never stolen by female family members. 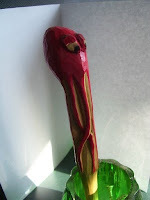 Whittlings are footloose, and likely to roam when guests stop by. Carving needs a place to happen- a shop, shed, room. Whittling just needs a knife and a piece of wood.